Over the past 20 years, venous thromboembolism (VTE) has become the second cause of death in cancer patients, where it accounts for increased morbidity, mortality, and health-care costs. Incidental VTE is increasingly diagnosed on systematic computed tomography scan evaluations, raising new questions in daily oncology practice. The exact mechanisms underlying the increase in cancer-related VTE are not fully understood. Risk factors include patient-related, cancer-related, and treatment-related parameters which vary for a single patient throughout cancer disease and which require repeated individual risk assessments. Cumulative results from studies in cancer patients with versus without VTE suggest that anticoagulation therapy prevents morbidity and may reduce mortality. However, despite the availability of effective and safe therapeutic options, VTE is often underrecognized and sub-optimally managed. Clinical practice guidelines addressing the management of VTE in cancer patients are heterogeneous and require adequate educational and active implementation strategies. This review, resulting from an extensive literature search, aims to summarize the recently published evidence-based guidelines for treatment and prophylaxis of cancer-related VTE, as well as the place of new oral anticoagulants in the treatment strategies. Adherence to guidelines could substantially decrease the burden of VTE and increase survival in cancer patients. Background: Beta thalassemias are a group of hereditary blood disorders that are characterized by reduction or complete absence of the β-globin chain synthesis due to mutations, affecting critical areas of the β-globin gene on the chromosome 11. The disease is inherited in an autosomal recessive manner, with severity ranging from asymptomatic individuals to transfusion dependent anemia, according to the nature of the mutation. The prevalence of the β-globin gene in various areas of Saudi Arabia, previously reported as 0.01 to 0.15% in general population. Materials And Methods: A cohort of 131 samples, which were submitted for β-globin gene mutation analysis in King Faisal Specialist Hospital and Research Center during 2008 to 2013, were tested for the entire genomic region (3-Exons and 2-Introns) of the HBB gene by direct Sanger sequencing technique. Results: Out of the total population tested, 28 (21%) were undetectable cases and 103 (79%) were detectable for β-globin chain mutations. Nineteen different mutations of the HBB gene were identified in all detectable cases (103 patients). Among these mutations c.315+1G>A, c.118C>T, and c.92+5G>C were detected in the majority of cases (66%) with five novel mutations (c.410G>A, c.-151C>T, c.68_74delAAGTTGG, c.316-3C>A, and c.-31C>T) that are reported for the first time in Saudi population. Discussion: The result of this retrospective study confirms the previously reported common β-thalassemia mutations among Saudi population. Introduction: Neonatal sepsis comprises a major problem in India. Early detection of neonatal sepsis is challenging as clinical signs are subjective and the gold standard, a positive culture, requires 1–3 days. Volume conductivity scatter (VCS) data were obtained simultaneously with the differential count without additional cost or sample requirement. The present study was undertaken in a tertiary care teaching hospital with the aim of evaluating VCS data and other laboratory parameters for diagnosis of neonatal sepsis. Materials And Methods: Peripheral blood samples of 500 consecutive neonates were analyzed over a period of 2 years for complete blood count (CBC) with band cells, eosinophils, C-reactive protein (CRP), and culture. VCS parameters were obtained simultaneously from Beckman coulter analyzers for neonates aged 0–28 days with suspected sepsis. Controls: Gestation-matched healthy controls with no clinical or laboratory suspicion of infection. The study population was divided into following groups: proven sepsis, clinical sepsis, and no sepsis. A cutoff value of 0.3615 based on CRP, mean neutrophil volume (MNV), and volume distribution width (VDW) was taken to indicate the presence or absence of sepsis; based on the previously published work by Celik et al. Results: A total of 500 consecutive samples of neonates admitted in neonatal Intensive Care Unit of Bharati Hospital were analyzed. All the three groups were analyzedd with respect to CBC values, peripheral blood smear, VCS parameters, CRP values and blood cultures which gave a sensitivity of 76%, specificity of 88%, positive predictive value 77%, and negative predictive value 87%. Conclusions: We analyzed the utility of VCS parameters along with CRP for early diagnosis of neonatal sepsis. The study results indicate that the factor based on MNV, VDW, and CRP with cutoff of 0.3615 is a useful indicator of neonatal sepsis without incurring additional cost, with high specificity (88%), and high negative predictive value (87%). Introduction: Adequate levels of antioxidants are essential in subjects with sickle cell anaemia (SCA) to counter the effects reactive oxygen species generated during normal red cell metabolism. Objective: This study evaluated serum glutathione transferase activity and vitamin E levels in comparison with disease severity in steady state adult SCA subjects. Subjects And Methods: Five milliliters of venous blood was collected from each of 30 homozygous haemoglobin SS, 30 heterozygous haemoglobin AS and 30 haemoglobin AA subjects for glutathione transferase activity, vitamin E levels, haemoglobin phenotype and full blood count determination. The objective score of disease severity was calculated using white cell count, haemoglobin concentration and number of life time disease related complications and correlated with serum glutathione transferase activity and vitamin E levels, using the Spearman's correlation; P < 0.05 was taken as significant. Results: The median serum Glutathione transferase activity and vitamin E levels in all study participants were 22 U/L (Q1 –Q3; 15:00 U/L – 28:50 U/L) and 32:00 ug/ml (Q1 – Q3; 17.00 ug/ml – 54.00 ug/ml, respectively). 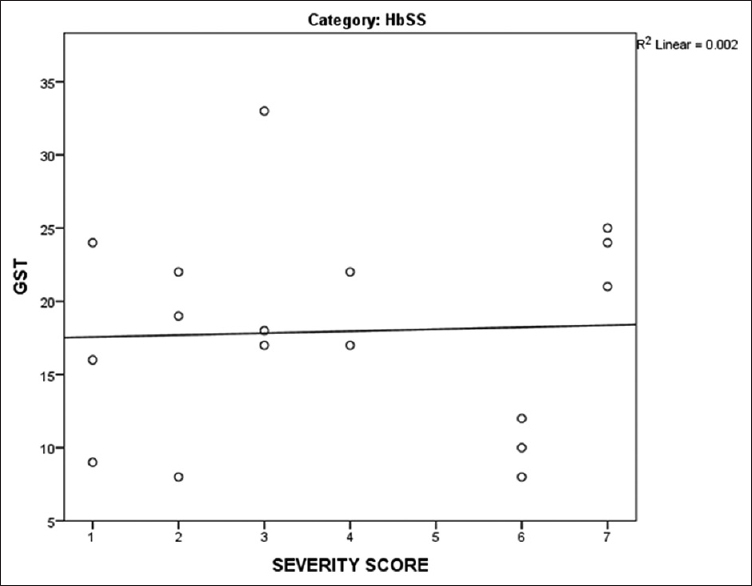 Glutathione transferase enzyme activity was significantly lower in HbSS compared with HbAA (P = 0.001) and HbSS compared with HbAS study subjects (P = 0.01). Enzyme activity and vitamin E levels did not show significant correlations with disease severity in subjects with HbSS (r = 0.07; P = 0.94 and r = -0.04; P = 0.12, respectively. Conclusion: Serum glutathione transferase activity and vitamin E levels may not be predictors of disease severity in SCA patients. Acquired amegakaryocytic thrombocytopenic purpura (AATP) is an uncommon disorder with thrombocytopenia and selectively suppressed megakaryopoiesis, often mistaken as immune thrombocytopenic purpura (ITP). 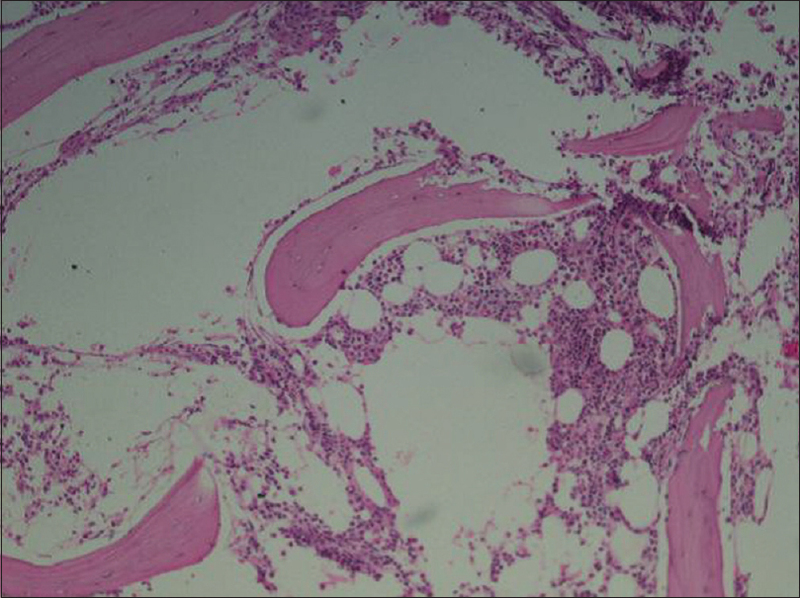 It usually does not respond to steroids, and bone marrow examination shows complete absence of megakaryocytes. The treatment and prognosis of AATP vary greatly from ITP; therefore, it is important to diagnose and treat this condition early, as it can progress rapidly to complete bone marrow failure. In this case report, we report a patient with AATP responded well to cyclosporine therapy. Severe chronic neutropenia is the main feature of infantile genetic agranulocytosis (Kostmann's Syndrome) associated with recurrent febrile bacterial infections episodes with fatal outcome. This study evaluated the effects of Nigella sativa seeds (Black seeds) and Saudi honey supplementation on the survival rate and frequency of febrile episodes of a Kostmann's syndrome patient. The patient was diagnosed with Kostmann's syndrome at 7 months of age and showed persistent neutropenia with an absolute neutrophilic count of 0.2 × 109/L and was admitted 26 times for infection in the first 2 years of his life. Unfortunately, he had no human leukocyte antigen matching donor for stem cell transplant and developed a cataract after being given granulocyte colony stimulating factor therapy Filgrastim. After supplementation with Nigella sativa and honey, the patient showed dramatic improvement. There was no admitting history to the hospital related to infection, and he has resumed a normal life style with regular school attendance. The patient is currently 15 years old. It would be concluded that a synergetic effect exists between Nigella sativa and honey which will improve the potency of the immune system with a marked reduction in infection and improved his survival. Further studies are needed to confirm the conclusion. Dimorphic anemia (DA) is characterized by two different cell populations. One population is of microcytic hypochromic and other being either normocytic or macrocytic. 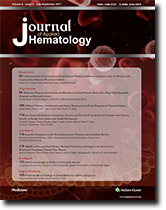 A retrospective study was undertaken to correlate and compare the clinico-hematological parameters in DA done over a period of 6 months. All cases of anemia diagnosed during this period were analyzed and all cases diagnosed as DA in the peripheral blood smear (PBS) were included in the study. 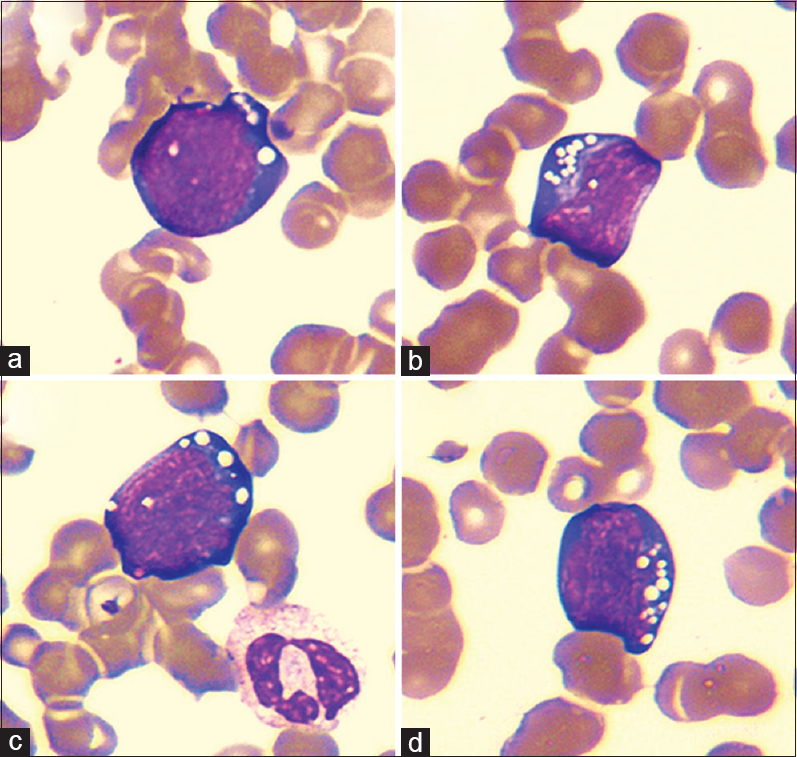 In PBS, dual population was seen in 17.5% of cases of anemia (178), comprising microcytic hypochromic with normocytic normochromic red blood cells in 37.1% of cases (66) or macrocytes in 62.9% of cases (112). Pancytopenia was seen in 9.55% (17) cases and bicytopenia in 50.5% (90) patients. Only eight cases had bone marrow correlation. All marrows were hypercellular showing megaloblastic erythropoiesis. DA is one of the common anemia but is an undermined entity. In low-resource settings, clinical and hematological parameters are of paramount importance for diagnosis and guiding treatment.